A short visit to Tyneham before the rain starts. Remains of some of the buildings in Tyneham. For those who don't know, Tyneham is an abandoned village within a live firing range and open at select times to the public. Mupe Rocks the other side of the bay. Time to head up the steep slopes of Worbarrow Tout to see what the view's like from up there. A panorama from the top of Worbarrow Tout. Mupe Rocks to the left and Gad Cliff to the right. Click for larger version. Sunshine on Gad Cliff. 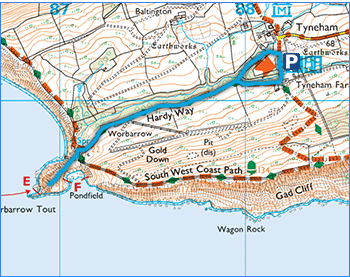 The original plan was to follow the Coast Path along the top and back to Tyneham, but the dark clouds came in quickly. About 15 minutes after this photo was taken the heavens opened. St Aldhelms Head. You can just make out the Norman Chapel on the end of the cliff. And in the complete opposite direction; Portland Bill.